Well, ask Siri to remind you to do something. (3) provides a scripted response fed from Apple (though for basic stuff like alarms, it’s probably already on-device). Since (2) and (3) are done via remote back-end Siri servers or something, Apple is completely free to make whatever changes and enhancements to, say, improve transcription speed/accuracy, or respond with the Siri writers’ latest “canned responses”/Apple-approved humor. 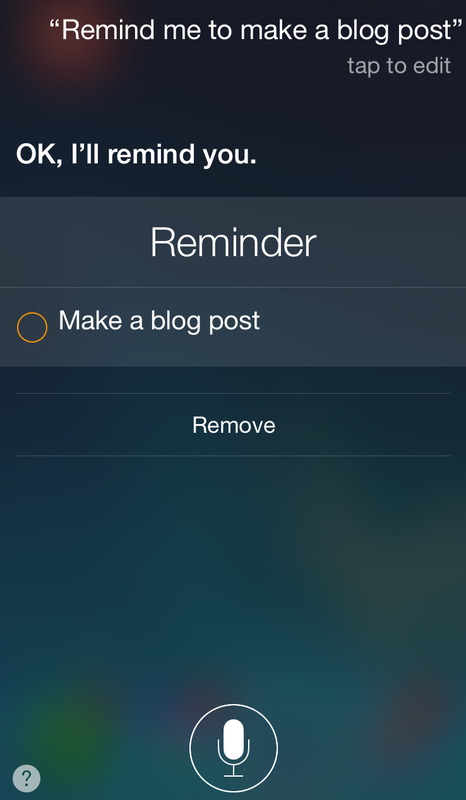 A second fact about Siri: Reminders changed recently on the out-since-April iOS 8.3. Actually, now that I think about it, there’s two changes. First, Siri finally stopped asking me “Here’s your reminder…shall I create it?” Second, Siri offers an “undo” (“Remove”) button that didn’t exist before. Whether this code was added to Siri or is only now activated, up and running, the welcome change of removing an “are you sure?” step from the usual interaction model also happens to be something I don’t think Apple has ever done for Siri. In my exceedingly humble opinion, the reason this small step is both big and important is Apple advanced Siri’s functionality on-the-fly by allowing it to immediately execute the user’s intent (reminder creation). Maybe the skeptic is right, but my rejoinder – Apple may have just demonstrated, through this mundane improvement, that anything Siri is hooked into via existing firmware can be optimized, and the interface adjusted, without a firmware update. Bad pun aside, I’ll be watching the space as a Siri user who sees so much untapped potential remaining. Siri just proved itself to be a more dynamic and adaptable work-in-progress than I initially believed, and I like where Apple’s going with this, even if this step is modest to the point of going unnoticed. The ability to continually refine Siri towards being a more functional and capable voice-activated assistant, in “real time”, will prove very important as the “AI Wars” rage on between Apple and its competition. * That would be your humble correspondent’s Internet nom de plume, tag, whatever, just in case you didn’t know. ** If I’m right…love it! It’s a small niche I occupy at Blog Lane, and often lonely, but still fun.